Heyyy spooksters! Who is excited about another Halloween-themed review??? I know I am! Today's review is actually Part 2 of my See Clear review that I began last month. I thought it would be best to separate the circle lenses from the Fierce lenses, so that I could save these awesome lenses for a Halloween review. >:D Today is your lucky day! 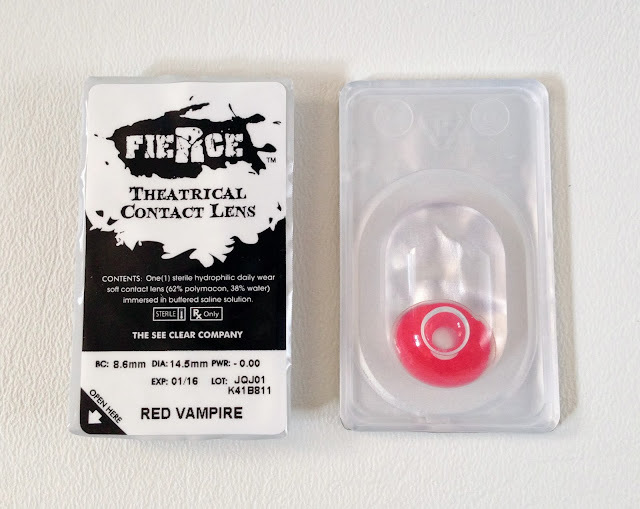 These lenses are Red Vampire and White Out from See Clear's FIERCE Collection. I am so excited to review these today because I LOVE costume lenses! These definitely give off a creepy effect. 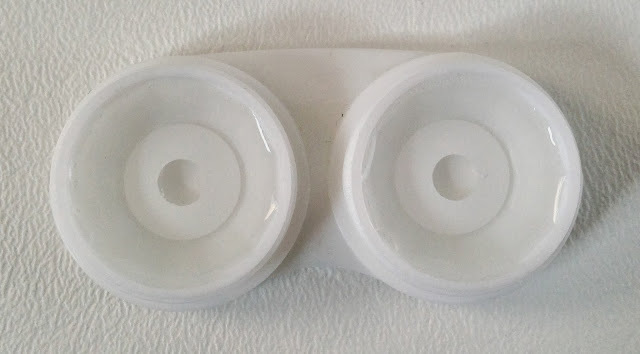 Let's start with White Out, which you can buy from EyeStylez! Here is the box! I like how they labeled what it is on the back, though with the Fierce lenses, it's pretty obvious. It would be a nice touch with circles which can often be much closer to each other in design! Let's open it up! 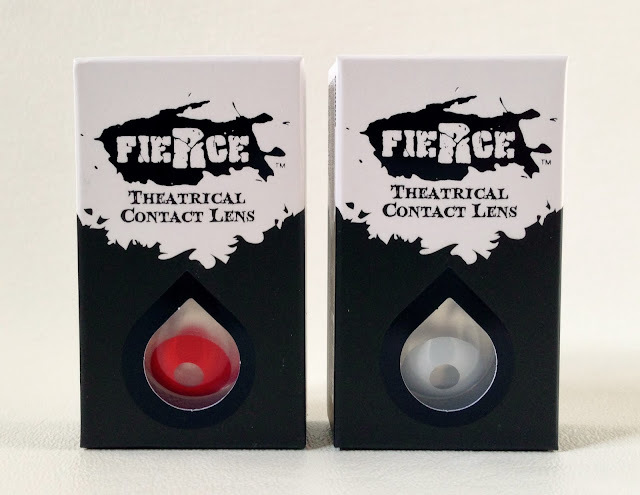 The Fierce lenses are both in individual containers. You just peel back the silver coating to get to your sealed, fresh lens. Here is what White Out looks like! Pretty dang white! 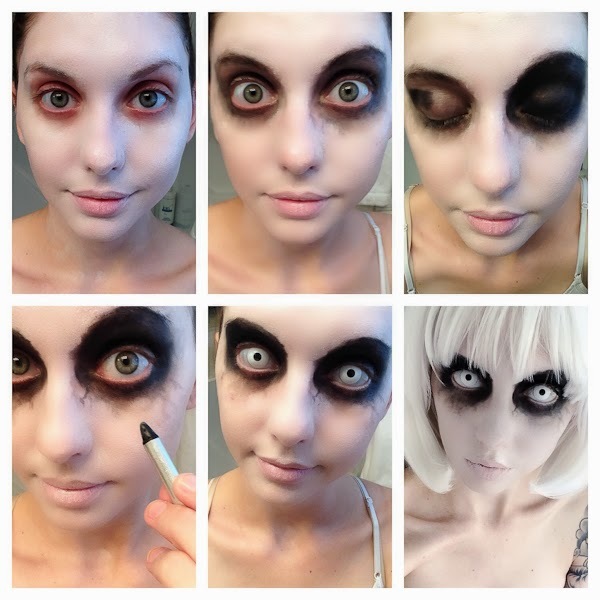 For the first look, I used the white base and the black crayon from the vampire kit to create my haunting look. This is a very basic makeup look, so I made a QUICK photo tutorial of the steps to create it. First, use the white base to cover your face (Photo 1) I was hoping it would dry but it never did, so I ended up using some powder to set it. Then I used the black crayon to color black circles around my eyes (Photo 2). I smeared it out with my finger. It's very creamy so it's easy to smear. Then to make it darker and to set the black, I did a layer of black eyeshadow on top of the black crayon (Photo 3). Tap the eyeshadow on instead of dragging it across your lid. This helps it stay fully pigmented and helps control fallout. Then I drew black lines/cracks/veins/whatever coming out of the black eye sockets with the black crayon (Photo 4). 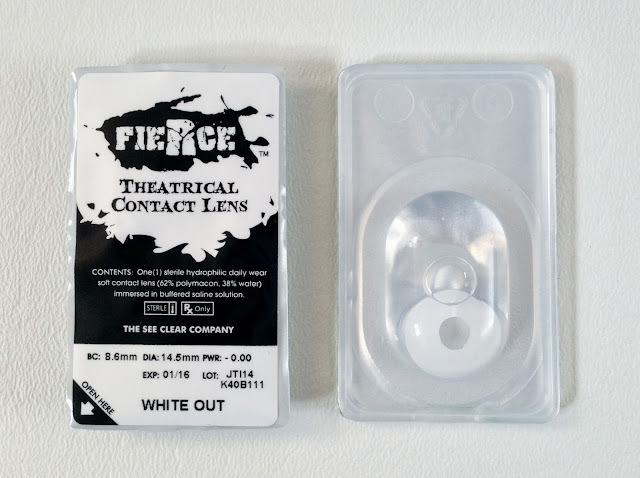 Then put in the See Clear FIERCE White Out lenses (Photo 5). Pop on a GLW and you're ready to scare your neighbors! Boo! Mwahaha... I fully enjoyed sitting in the window and scaring people. MWAAAAHAHAHAH I LOVE BEING CREEPY. These are exactly what they try to be. Definitely makes any color eye look white. This lens is designed to make your eyes look like it has no iris. The small hole to see through impairs vision slightly. It's much better than full white-out lenses that also cover the pupil, so I'll give it a 3/5. I wouldn't wear these too often because of the vision impairment (and because of the sheer terror I would inflict on everyone who glanced my direction). This would only look natural on a ghoulish zombie. Next up.... RED VAMPIRE! WOOOOHOO! Love it! Oh my gosh. Have I mentioned that I FREAKING LOVE HALLOWEEN?!>! It comes in a box with a label "RED VAMPIRE" just like it's creepy White Out brother. Same packaging as well. It's exciting to see a solid red contact lens staring out at you... Ohhh the possibilities! Here is how it looks with one Red Vampire lens in. :) FYI~ The lashes used in this look are Dolluxe Lashing Out Loud used on both top and bottom. They are pretty awesome right!?!? A look like this would not be complete without red contacts. See Clear pulling through in the clutch! Definitely makes any color eye look red. This lens is meant to cover the iris and make them appear solid red. It's not intended to enlarge. The small hole to see through impairs vision slightly. I wouldn't wear these too often because of the vision impairment (and because of the sheer terror I would inflict on everyone who glanced my direction). This would only look natural on a blood sucking vampire. Well, that's it for today's product review!~ What do you think of See Clear's White Out and Red Vampire? What about my Halloween looks?? Stay tuned for more Halloween review coming soon! with the subject "*Shop Name* Product Review"
Wow! You look so scary with this outfit and the Halloween contacts you have worn to get different scary look are amazing. Romwe "Hot Autumn Pieces" 48 hour Flash Sale!